EWG > Agmag > Glyphosate Is Spreading Like a Cancer Across the U.S. 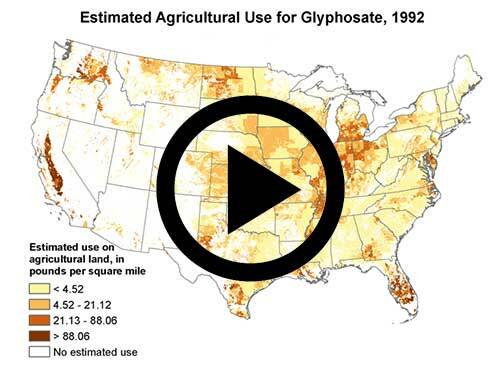 This image shows the year-to-year change in glyphosate use on American farmland from 1992 to 2012. Glyphosate is the active ingredient in Roundup, Monsanto’s widely used weed killer, which according to the World Health Organization is “probably carcinogenic to humans.” Public interest groups are asking the U.S. Environmental Protection Agency to take into full account in its deliberations this new assessment by the world’s leading authority on public health. Given the increased use of herbicides in connection with GMOs, it’s no wonder that more than 90 percent of consumers want the right to know if the food they buy contains genetically engineered ingredients. The current voluntary labeling system is not getting the job done. The only way for people to know for sure what’s in their food is to require nationwide labeling of GMO products.